Until we know exactly how long oil is going to be gushing in the Gulf of Mexico and what it's going to take to clean up the mess, every penny of BP's assets should be confiscated and held in escrow. Also, everyone making money from BP's negligent practices in recent years--including the shareholders--should get an actual financial penalty. Companies are ALWAYS going to try to get away with whatever they can to make a profit. And shareholders are always going to pressure companies to do whatever they can to make a profit. They should lose BIG here, just as they've made others lose big. If corporations are, indeed, "persons" as the Supreme Court now believes, they should be subject to their own wages being garnisheed, right? Hungry to hear a dawn chorus? This one has a few traffic sounds--it was made on May 14, 2008, from my Ithaca apartment balcony. I just read that John Schoenherr has died. He was a fabulous illustrator--he won the Caldecott for the wonderful Owl Moon, and also did a lot of covers for Analog, my husband's favorite science fiction magazine. 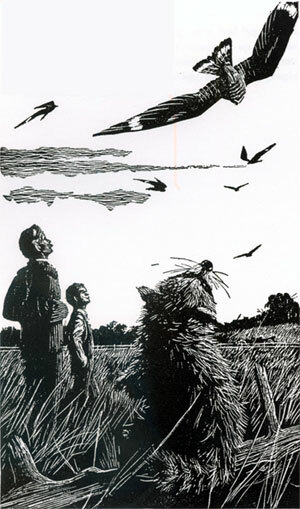 And he gave me permission to use this ethereally beautiful scratchboard illustration from Rascal on my blog. The world is a little darker for me today. Doesn't this photo just beg for a funny caption? Bummer. There's an eagle nest right in that area. My little bird-dog is 12 years old today! We celebrated by going to Montezuma NWR before learning that-a fire started last night near May's Point, and the wildlife loop was closed. It's a bad-looking fire--I could see the smoke all the way from Ithaca!